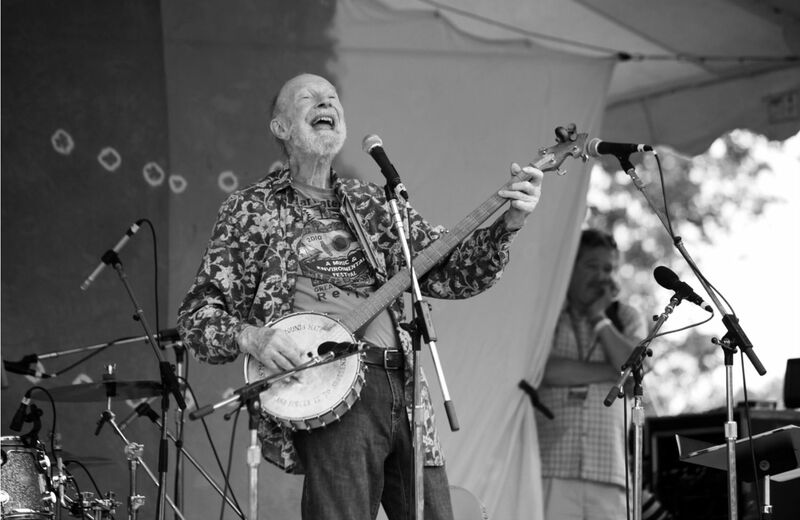 Bruce Springsteen celebrated Pete Seeger’s ninetieth birthday by telling the great folk singer and activist, “You outlasted the bastards, man.” And so he did. Seeger, who died on January 27 at 94, was singing with Woody Guthrie when “This Land Is Your Land” was a new song. And because he meant and lived the words of the oft-neglected final verse—“Nobody living can ever stop me, / As I go walking that freedom highway”—Seeger was hauled before the House Un-American Activities Committee in the 1950s, blacklisted and sent to the sidelines of what was becoming an entertainment industry. But Seeger just kept singing “This Land,” kept writing songs like “Where Have All the Flowers Gone,” kept playing a banjo inscribed with the message “This machine surrounds hate and forces it to surrender,” and kept rambling across the country and around the world—for every cause from labor rights to civil rights to peace. It was this understanding of music as art and mission that drew Bob Dylan and Bruce Springsteen and Billy Bragg and Ani DiFranco to the man whose energy, warmth, intellect and Integrity they emulated. When Springsteen invited Seeger to perform as part of the celebration of Barack Obama’s first inauguration, they sang “This Land Is Your Land” the way Seeger liked it: with “all the verses—all the ones that Woody wrote, especially the two that usually get left out.” So a new president heard an old lefty take a class-conscious swipe at the “Private Property” signs that turned away union organizers, hobos and banjo-pickers.